After making so many drawstring bags, I started itching to work on a quilt project over the weekend. On Saturday afternoon, I pulled out Orange Crush. After a lot of back and forth on whether I wanted to add a border to the top or not, I auditioned some Kona White and Kona Bone as a simple border for the top. The pure white was too bright, but the bone looked really good against all the orange. Because I worried about how well I would be able to maintain the points of the diamonds on the edge of the quilt after quilting, squaring, and binding, I decided to go ahead and put on a simple 3″ wide border around the top. I do like how it frames out the bright orange and gives definition to the edges and points of the diamonds. As I plan to bind it with a bright orange, I think the border was the right choice to break things up a bit. With the border, the pieced top measures 62.75″ by 62.75″. Next, I took all the remaining orange strips (which happened to all be in the darker orange colorway) and pieced them together. I then subcut the strip into quarters and pieced together a long chain of orange stripes to use for a pieced backing. On Sunday, as I was getting ready to finish piecing the backing, I realized that I do not have any batting large enough for this quilt on hand. My local quilt store is closed on Sunday and Monday, so I did not plan this out very well, did I? Oh well. It did not take long to finish piecing the backing together, and I think I am really going to like both sides of this quilt. I currently have 15 hours of work put into this project, and I am estimating it will take me another 9-10 hours this week to quilt and bind it. Mondays and Fridays are usually my busiest and least productive sewing days. My list of things to do around the house was 11 deep this Monday morning, and I have to admit that I feel a lot less guilty spending time at my sewing machine during the rest of the week knowing that I have already taken care of so many things around the house. Speaking of which, I guess it is time to put off my procrastination and cross the last (and least favorite) item off of my Monday list: vacuuming. I know where I will be on Tuesday morning at 9am: buying batting as soon as my LQS opens! Ahhh, it’s so disappointing to be ready to quilt and not have batting on hand! Been there, done that. 🙂 The orange binding will really pull everything together, you made a great choice with the color of the border. 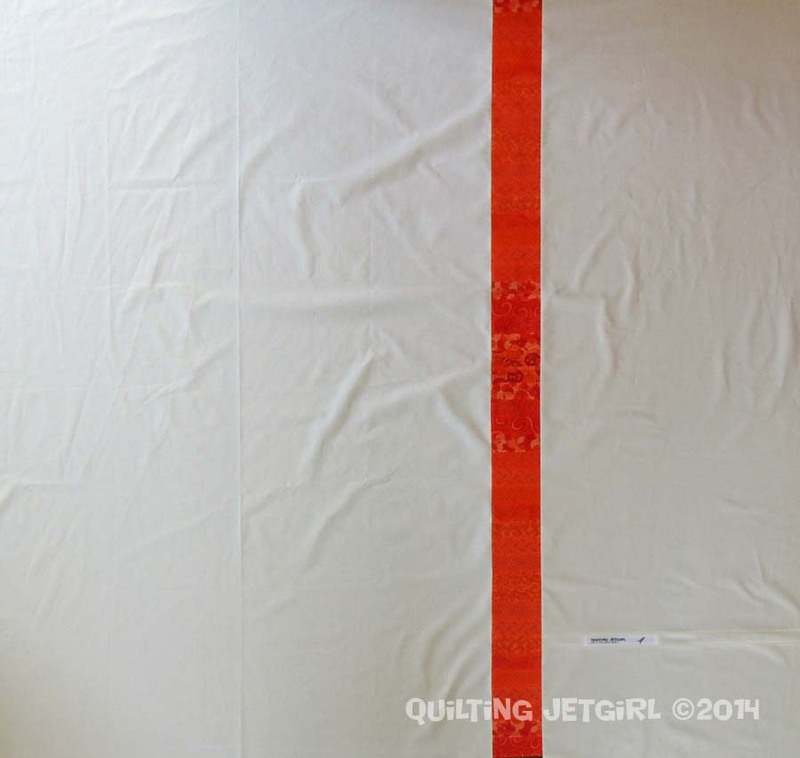 Have fun quilting this week…..I’m off to do some chores before sewing! 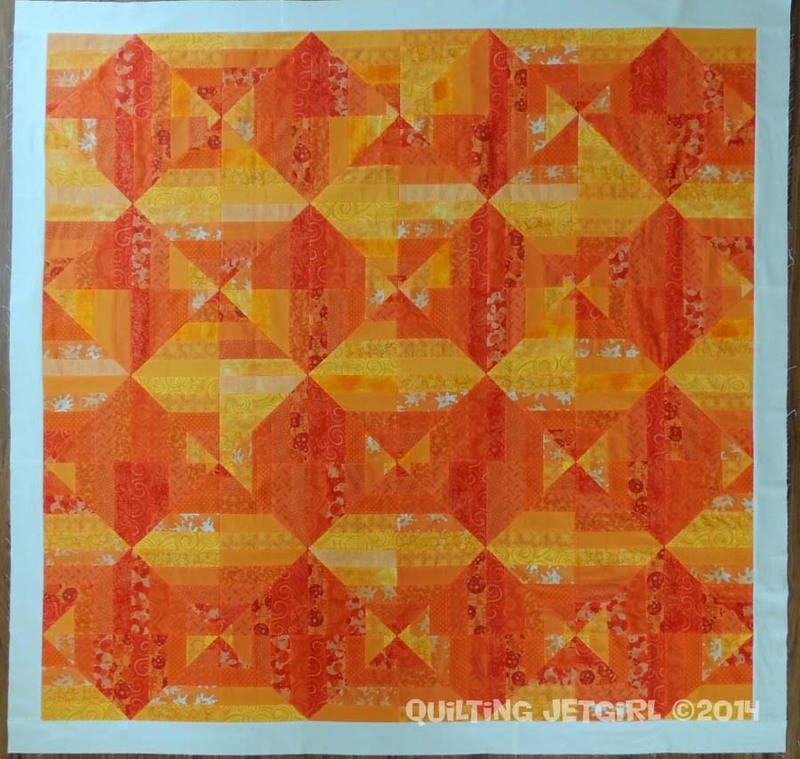 Intrigued by your plan for quilting – this is looking great so far. I finished a quilt backing too over the weekend and had the batting on hand but still haven’t basted it! Psyching myself up for the task! I just ordered a roll of batting. . . I decided that when I am ready to baste, I better have that stuff on hand LOL And the only LQS that carries wool has been out that last several times I was there – extremely frustrating! I got my roll. . . now I gotta get making 🙂 Love this top! I think your quilting plan will work out well! Cannot wait to see it all quilted up! How am I going to fit this top into my schedule???? I love the simple border you added. I think it will look great. I hate it when I run out of things and have to wait for the store to open. I used to run out of basting spray all the time. Now I buy three cans at once. Good idea adding the border to keep the points from getting snipped off at some point. I like the simple back, and your plan for quilting! My favourite way to make a backing! So much easier than trying to make the seam disappear! Your quilting idea seems interesting! Can’t wait to see how it looks. i love the simple border, it really frames the top. What a cool quilt! Did you foundation piece the blocks or are they string pieced bigger and then cut up? Every time I think of using different threads for top and bottom I chicken out, irrationally fearing tension problems that are possible to fix. I think your quilting thread choices are spot on, however. Go for it! I hate ironing far more than vacuuming. I have hugely been into coral and/or orange this year… it’s always fascinating for me to know how others things alike or not alike on what colors remind them of what season or specific time, etc. LOVING this orange and all the shades of it! Lovely job! P.S. It really makes me think of a sun in a kaleidoscope.